Wastewater Impact Fees effective January 1, 2014 click here for more information. Cross Connection devices (backflow preventer’s) are required on water services. Each device shall be inspected by a certified inspection prior to occupancy and every year. Inspection forms must be submitted to the Chief Engineer. Failure to submit required inspection forms may result in termination of water service. Click here for the back flow preventer inspection form. For RESIDENTIAL water or gas service connection, the applicant must come to City Hall in person and sign a contract. A $25 deposit is required for a residential water meter and a $75 deposit is required for a residential gas meter. The deposit is only refunded when the account is closed. For new COMMERCIAL water or gas service, the applicant must obtain an occupational license, which requires the applicant to come in person to City Hall. After receipt of license, the actual deposit amount is determined by the city permit clerk. As required per 40 CFR 141.86(a) and LAC 51:XII.1703, the City of Gonzales monitors drinking water for lead and copper at various structures within the city limits. The City of Gonzales does not utilize water meters, water fittings, or water distribution piping that contains lead. However, some homes were once constructed using lead plumbing materials. 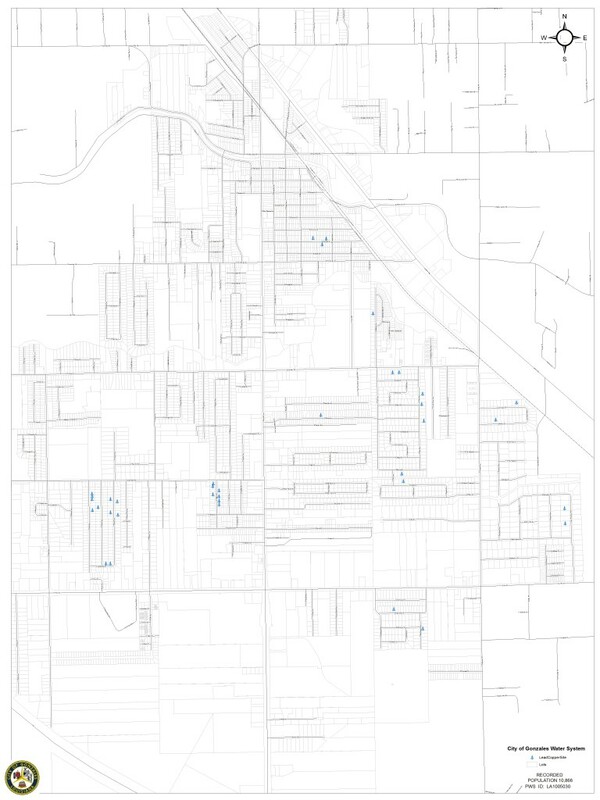 For more information regarding the locations of lead sampling, please view the below map. The City of Gonzales has provided residents with an informative sheet entitled Living Safely with Natural Gas. We encourage you to review it to find out more. Before you begin any project, use our states’s One-Call System to call before you dig. The service is available free of charge so that you can proceed safely with digging, trenching, blasting, excavating, drilling or plowing. Never guess where a pipeline is located, call 811 instead. To pay your City of Gonzales utility bill online, click the link below.